MagicPlot Calculator is a useful formula calculator built in MagicPlot. To open calculator use Tools → Calculator menu item. Calculator window stays on top when MagicPlot main window is minimized to task bar (Dock on Mac), so you can use the Calculator when working with other applications. MagicPlot Calculator uses the same formula syntax as other formula fields in MagicPlot application. 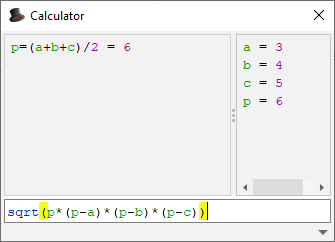 Calculator supports comma (,) as decimal separator (1.2 = 1,2), so use semicolon (;) as function arguments separator: min(1;2). MagicPlot Calculator supports user-defined variables.